BAGHDAD, Iraq (CNN) -- Members of an Iranian group say Iraqi forces have beaten and abused them as Iraqis move to expel the Iranians from a camp on Iraqi land. About 3,500 people live at Camp Ashraf, where members of the People's Mujahedin have lived for 24 years. The Iranian group -- designated a terrorist organization by the United States and Iran -- has asked the United States to intervene on their behalf. About 3,500 people live at Camp Ashraf, most of them members of the People's Mujahedin Organization of Iran who have lived at the camp for 24 years after fleeing Iran. Iran, Iraq, Canada and the United States consider the People's Mujahedin, which opposes the government in Tehran, a terrorist organization, although the European Union removed the group from its terrorist list in January. The United Kingdom did so last year. 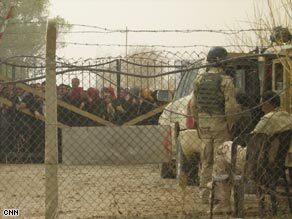 The People's Mujahedin accused the Iraqi military of entering the camp north of Baghdad on Friday and forcibly evacuating a building that served mostly as a women's dormitory. Ashraf residents rallied Monday against the military, chanting for Imam Hussein -- the Prophet Mohammed's grandson and a holy figure for Shiite Muslims -- to save them from the abuse of the Iraqi soldiers. Statements from the National Council of Resistance to Iran, an umbrella group of Iranian opposition organizations -- the largest of which is the People's Mujahedin -- accuse Iraq's Shiite-dominated government of doing the bidding of Iran's supreme leader, Ayatollah Ali Khamenei, also a Shiite. "The Iranian Resistance calls for urgent intervention of the U.S. government and competent international bodies to neutralize plots by the clerical regime and prevent a human catastrophe in Camp Ashraf," said a statement dated Sunday. Iraq's government denied that it was acting on Khamenei's behalf. "The Iraqi government's position is clear and there is no retreat from its decision to close Camp Ashraf," said a statement from the office of National Security Adviser Mowaffak al-Rubaie. "The national security adviser is only implementing the decision and the policy of the Iraqi government." The National Council also accused the Iraqis of barring delivery of all supplies to the camp except for food, banning Iraqi workers from entering the camp and blocking families from visiting relatives inside the camp. The Iraqi government statement denied keeping supplies from Camp Ashraf. "The Iraqi government continues to facilitate all humanitarian materials entering Camp Ashraf," the Iraqi statement said. " ... We welcome any visit by any international organization." A People's Mujahedin spokesman in Camp Ashraf called the statement false and asked international groups "to visit Ashraf and observe the facts and realities of the present situation by themselves." Maryam Rajavi, president-elect of the National Council and the long-time leader of People's Mujahedin, sent a letter to President Obama asking for help against "a conspiracy hatched by the religious dictatorship ruling Iran against the lives of 3,500 residents of Camp Ashraf." Rajavi cited comments by Khamenei during a meeting with Iraqi President Jalal Talibani last month calling for the expulsion of the People's Mujahedin from Iraq and later comments by former President Akbar Hashemi Rafsanjani during a trip to Baghdad calling for Camp Ashraf's closure. After those remarks, the National Council said, al-Rubaie declared that the Iranians at Camp Ashraf had no right to refugee status or to political asylum and would be expelled either back to Iran or to a third country. Rajavi, in her letter to Obama, asked the president to "issue an order so that the arrangements for the protection of Ashraf are reinstated to that which was in place before January 2009, i.e., the U.S. forces be tasked with the protection of Ashraf." The U.S. military in Iraq had no comment on the matter, referring queries to the State Department, which did not have an immediate comment. Also known as Mujahedin-e-Khalq, People's Mujahedin was initially formed to oppose the shah of Iran, but fell out of favor with the Islamic revolution of Ayatollah Ruhollah Khomeini after 1979. People's Mujahedin, which promotes a secular, Marxist government for Iran, waged a violent campaign against the fundamentalist Islamic Tehran government -- including bombings that killed politicians, judges and Cabinet members -- for years. The group allied with Saddam Hussein in Iraq in the mid-1980s and fought with the Iraqis against Iran in the latter years of the Iran-Iraq war. People's Mujahedin renounced violence in 2001, but a group of 12 former members told Human Rights Watch in 2005 that they were subject to physical and psychological abuse when they made it known they wanted to leave the organization. The National Council accused al-Rubaie in particular of "clearly implementing the dictates of Khamenei" and said he should "be prosecuted by international forces."